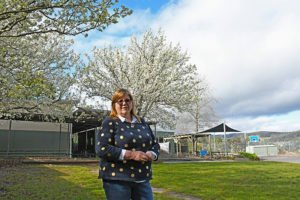 Having had seasonal farmers for parents and moving from one rural community to another, Julie Reggardo is happy to have set down deep roots in Yinnar South. She calls it her forever place. Photos and report by Gerard Cockburn. It was the first place Julie Reggardo felt a sense of belonging, and where she met her husband David in 1974, while sneaking into the Yinnar pub underage. The couple married four years later, and have raised five children in their country farmhouse 10 minutes south of the primary school. Yinnar South Primary has been a focus in the Reggardo’s lives, being Julie’s place of employment as an education support worker, and where she has chosen to send her own children to school. “I thought if you went through with the one cohort of kids, that you make these lifelong friends,” Julie says. It was something she felt was lacking from her own childhood. One of the truisms of country life is that you’re always a newcomer unless you were born there. But Julie has worked hard to put down deep roots, and understand the dynamics that underpin the small town in the Latrobe Valley. Before the State Electricity Commission (SEC) was privatised between 1995 and 1999, the big power plants that still loom over the valley had a strong relationship with the surrounding communities. But that’s changed over the years, not least with the recent closure of neighbouring Hazelwood power plant. “When the SEC was going people would take two days off to help with the local fair. When privatisation came in you couldn’t afford to take two days off,” Julie says. Coal brought economic prosperity to the region for almost a century, so the global and national shift away from coal-fired power has had – and continues to have – a profound effect on the valley. The once mighty community-led Citizens Association which organised the town fair now only has five members and struggles to attract new ones. The association is in the stages of folding. Despite these travails, an undercurrent of fighting spirit showed itself recently when the local council proposed a rezoning plan. Julie is among locals who rallied to fight the proposal believing that it would substantially devalue the worth of their land. The silver lining of the exercise was the evidence that the community had not lost its spirit. Maintaining Yinnar South Primary has also been a battle, the little school on the hill having seen huge fluctuations in enrolments due to the wider economic uncertainty reverberating through the region in the fallout from policy shifts on the coal industry. Two years ago, it was down to just seven students – today its back to 18. The beauty of a smaller school, says principal Mark, is that it is able to provide close one-on-one support for students. Julie’s role is at the core of that program. But it’s not always easy, she says, because resources are extremely tight, and in a country town, accessing specialist support is not always possible. What the school has been able to do is to build a strong manual task program, something that is highly valued by many of the students, and vital to the school’s culture, says Mark. 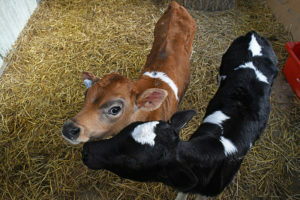 For Julie, taking a student out to spend time tending to the vegie patch, or to feed the calves or collect eggs from the resident chickens, provides a powerful opportunity to connect with and support students.